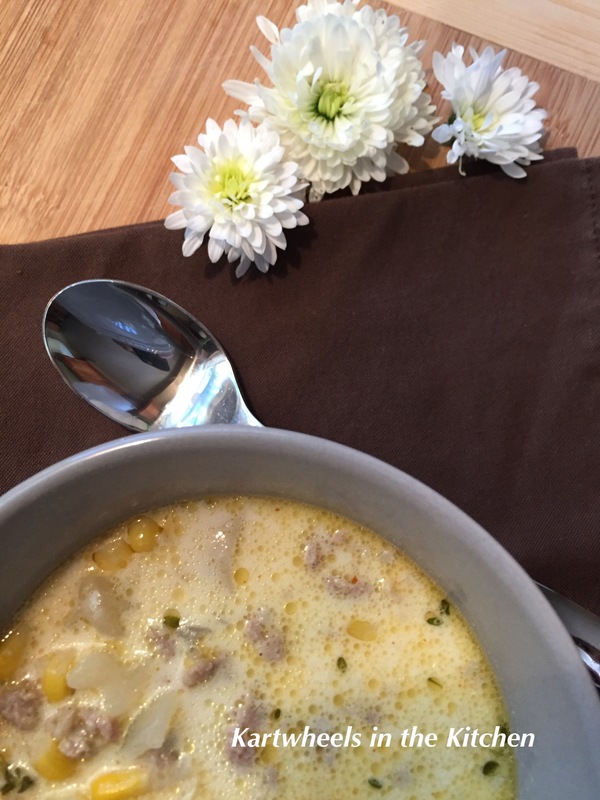 Now that the weather has FINALLY taken a turn towards autumn and the days and nights are a little cooler, it makes me want to be in the kitchen baking treats, bread and…making soup! This bisque has been a favorite for a while now. It’s very easy quick and easy to make and it is practically fool proof. You can add more cream if you like or substitute the light cream for heavy. You could add cheese, more shrimp. You could use sherry. And you could always add kale or spinach too. It is very versatile and easy to change up to what you are craving. As always, I love some warm bread with my soup, and a glass of wine of course. So, first you want to devein your shrimp and remove the tails. If you are using large shrimp, cut them in half so they are more bite size. Dice up your potatoes into small cubes, again bite size BUT if they are small cubes they will cook quicker. I use diced frozen potatoes, the work is already done for me!! Using the herbs is optional of course but I still have plentiful amounts of thyme and rosemary so I have been adding them to lots of recipes! You could use whatever herbs you have on hand and love. In a heavy soup pot, sauté the shrimp, onions and potatoes for about 10 minutes, salt and pepper. Add the stock, tomato paste and corn, using a light simmer, cook until the potatoes are tender. Add the cream, herbs and the slurry. If adding kale or sherry you can add it now. Once the soup has thickened, turn off the heat and serve. Garnish with shredded cheese, bacon, sour cream, whatever you like. Serve with crusty bread or I made Rosemary Focaccia bread to go with this soup. Hamburger Vegetable Soup, More like Cheeseburger Soup! 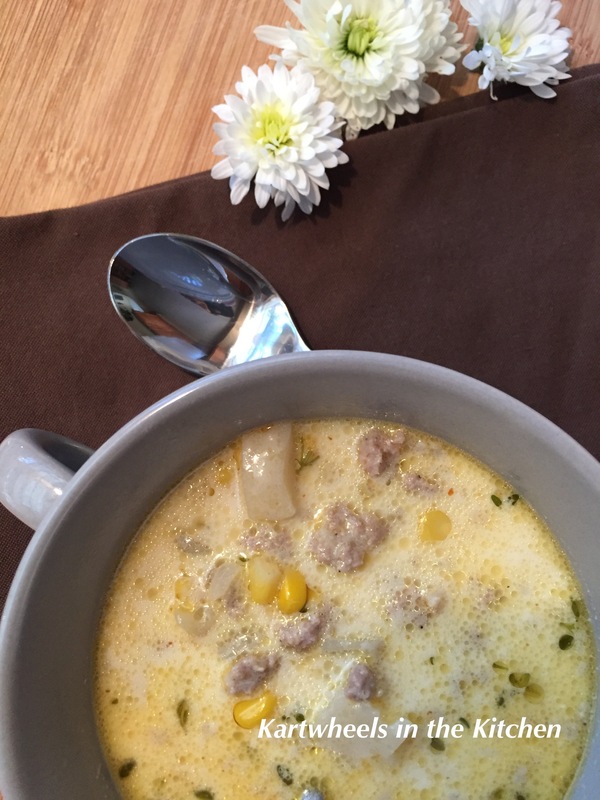 This soup whips up quickly and is so easy to make! And I used to make this soup many many years ago when my kids were little. 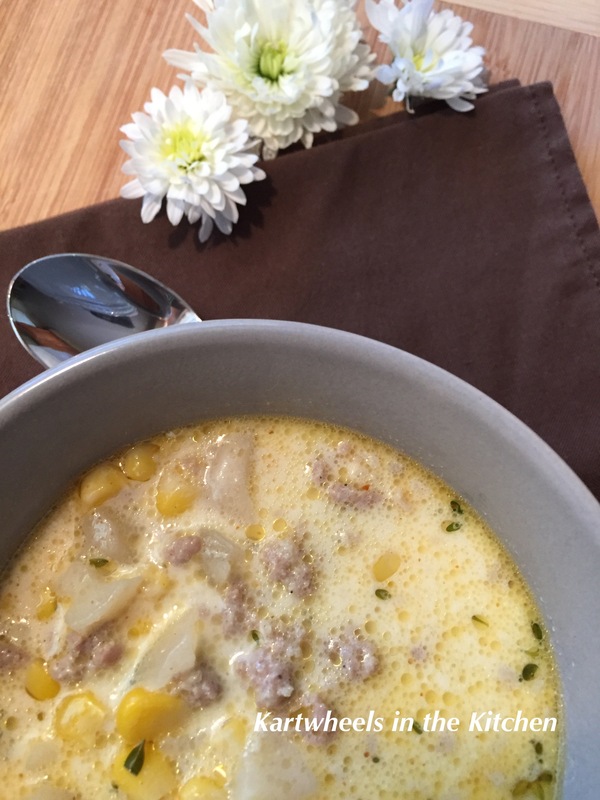 It was my go to soup on autumn days when my boys played elementary football. And my daughter disliked it!!! But I still made it and everyone else loved it and I never had leftovers. I remember one day inviting one of her friends to come over for dinner after the game and she specifically commented that I better not be making “that” soup again (*rolling eyes). So, on with the soup, I snapped these pictures at work when I heated the soup for my lunch. So please excuse the awful photo’s!! It’s just hamburger, onion, canned vegetable soup, sprigs of herbs and cheese. So maybe I should be calling this Cheeseburger Soup. I still on occasion make it for myself, but I prepare it just a little differently. Now I like to add sprigs of herbs like thyme and rosemary. And cheese, but not just any cheese! I use that processed cheese that comes in a foil wrapper!!! And I am not ashamed of it either! And man oh man is it even more delicious than when I made it for my little munchkins. So, there is no way to mess up this soup, it’s just that easy. I usually plan on about a ¾ pound of hamburger and 2 cans of soup for 4 people. Brown your burger and onion, add salt and pepper. When that’s done, pour in the cans of soup, herbs and the cheese. You can add as much or as little cheese as you want. I only like enough to make it creamy. You only want a light simmer, just enough to heat up the soup and melt the cheese, and then it’s done. Brown the meat and onion. Then add the canned soup, cheese and herbs, bring to a light simmer. When the soup is heated and the cheese is melted, serve.